The academic credentials of faculty members of O.P. Jindal Global University are very impressive (EW January). It’s heartening to see an Indian varsity according high importance to internationalism. Highly-qualified international faculty provides a global outlook and exposure which helps prepare Indian students for international trade. These are early days for JGU. Hopefully it will live up to the expectations of the country’s academic and parents communities. I fully agree with businessman-philanthropist Naveen Jindal’s suggestion that India needs to urgently strengthen its philanthropy culture (EW January). His father the late Shri O.P. Jindal was exemplary in promoting educational initiatives across the country. Fortunately, Naveen has inherited his spirit of philanthropy. N.R. Narayana Murthy, Anand Mahindra, and Ratan Tata among others, who have made their fortunes in India, would have done well to give back to Indian society instead of donating millions to their Ivy League alma maters (Harvard, Stanford, Yale, Wharton and Cornell). Your cover story on O.P. 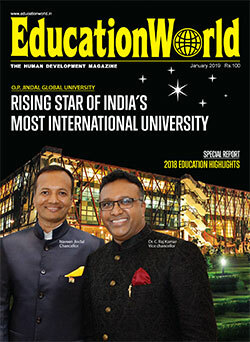 Jindal Global University (EW January) was a work of deep research. The story clearly demonstrates that given strong commitment of promoters, institutional capacity and reputation doesn’t take more than a decade to build. I hope your detailed feature will be a wake-up call to edupreneurs in higher education, as our students deserve qualitative education, modern infrastructure and best faculty. I am a regular reader of EducationWorld and congratulate you on publishing an excellent content-driven magazine. As a mother of two teenagers, I especially like the Career Focus section. In your latest issue, the feature on executive coaching was informative and useful. A mind-boggling number of new careers have sprung up over the past decade. Please keep up the good work and continue highlighting attractive new 21st century careers. Your editorial ‘Why BJP lost assembly election 2018’ (EW January) was insightful. If the BJP wants electoral success, it must change its policies towards the common man and stop using coercive methods to implement its regressive ideology and policies. On the other hand, the Congress party must remember that in the recently concluded elections in Rajasthan and Madhya Pradesh, which it won, anti-incumbency worked in its favour. Projecting Rahul Gandhi as prime minister may not yield the desired results for Congress which must elect a leader outside the Nehru-Gandhi family. It is sad how voters are being misled by populist vote bank politics election after election. Your special report ‘2018 education highlights’ (EW January) is a comprehensive compilation of last year’s education events. The Modi government has proved a big disappointment for the education sector with both Smriti Irani and her successor Prakash Javadekar failing to do anything substantial to improve the country’s dismal education scenario. Their promise to double the budgetary outlay for education to 6 percent of GDP remains unfulfilled. In fact, the BJP government has slashed spending for the social sector in general. Therefore, the forthcoming General Election is critical and every Indian must question electoral candidates on their education agenda before casting their precious vote. Your editorial ‘Urgent need to slash public holidays’ was apt and timely (EW December). Apart from holidays, thousands of man hours are lost because of nationwide bank strikes and bandhs. This is shameful and scandalous. In my opinion, strikes, hartals and bandhs should be banned because they disrupt the normal day-to-day lives of citizens and banking operations, inflicting huge monetary losses upon the nation.